It also automatically create backups for revert option? Yes, it makes a backup of all files (Blood.exe, Blood.RFF, Sounds.RFF) and restores them if you close the game normally which means using "quit" in game's menu. If you just close Dosbox, the files won't be restored untill you run WM again. Just follow the installation steps I wrote in the main post. 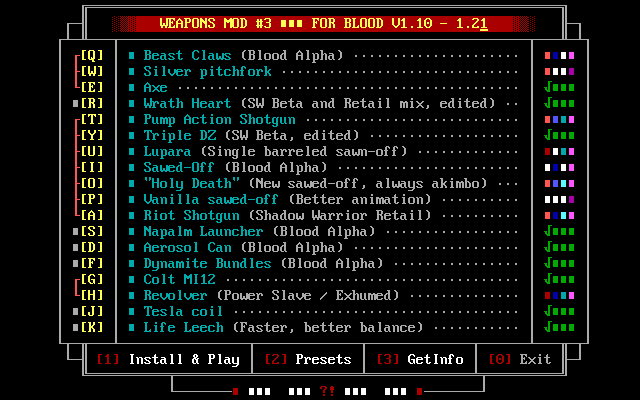 It is important to launch the game through WM launcher. When it's done, simply close Dosbox. The files won't be restored and you'll be able to use weapons in GDX. So, this isn't compatible with BloodGDX? Not directly. GDX doesn't have mod support yet. If it does, I'll make sure together with my buddy NoOne to port this to GDX with more features. WM3.0 was done for DosBox in mind but there's no problem to use custom weapons in GDX by just closing the DosBox's window when Blood is running. Found a bug tip of the shotgun does not líght up so it inherits the darkness level of the sector you are standing in. Ups, looks like I forgot to change lighting for one layer for alt fire, the first frame. Thanks! Easy mistake to make, no worries. Same thing on the retail shotgun with better animation, but the lower part when shooting. Haven't checked all guns. I fixed those and download links have been updated. Save it and now this weapon will be installed without the new sound. This won't work for Lupara if you don't like its reloading sound too cause it's one long animation which means fire and reloading are mixed and true reloading is just one frame. The new version should be released this month. The only sad part about this new version is that it won't be compatibile with GDX anymore. Almost every weapon have now different damage values, ammo count, value for pickup, extended animation possibilities (like different alternative animation for Flare Gun, Napalm Launcher and Leech), etc.